This week we fully launched the SaferPeterborough Prevention and Enforcement Service (PES) which brings together council, police, fire service and prison staff into a single managed service. The team has been in place since April, however council staff now have the Community Safety Accreditation Scheme powers issues by Cambridgeshire Constabulary’s chief constable to be able to enforce against a greater number of issues. Since the teams came together in April we’ve seen some fantastic results with 339 housing enforcement visits undertaken, 1,884 incidents of flytipping dealt with, 46 unauthorised traveller encampments evicted and 411 cases of anti-social behaviour tackled. The team has also carried out patrols to identify young people who could be at risk of child sexual exploitation, tackled nuisance motorbikes, carried out speed checks and removed blue badges from people using them illegally. Even with a bigger team, we cannot be everywhere at once so we rely on residents to be our eyes and ears. If you have issues and concerns to report where you live, use the MyPeterborough App or call 101 or 01733 747474. I had a rare opportunity on Monday to spend time one to one with the secretary of state for communities and local government, Sajid Javid MP, who is responsible for devolution. Mr Javid visited the area to meet the people who developed our proposed Cambridgeshire and Peterborough devolution deal and to find out how plans are progressing. I spent time talking to the secretary of state about our need for a university, more housing, better rail links and a greater say in how skills are delivered, all of which he fully understood. I’m proud to say that Mr Javid described our proposal as one of the most ambitious deals nationally and said that we are well on track to take our plans towards a deal. He urged us to press on and take advantage of what is on offer which is a £600million funding boost, massive investment in housing and new powers to help create jobs, improve skills and invest in transport. He was spot on when he said that our devolution proposals will put power into the hands of those who know their area best. Our devolution proposals will certainly generate additional jobs across Peterborough and Cambridgeshire, but according to Opportunity Peterborough’s annual Economic Intelligence Report, published this week, job creation is already something we’re excelling at. 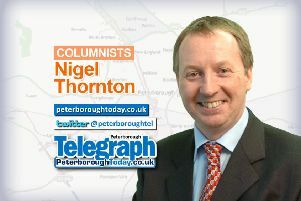 According to the report more than 8,000 net new jobs have been created in Peterborough during the last six years. This is great news and on the back of this week’s announcement that a £7million extension to Serpentine Green shopping centre in Hampton will create an extra 100 jobs. Commitment like this from the owners of Serpentine Green show a real confidence in our city’s economy. The Opportunity Peterborough report makes good reading for our city with net business creation 43 per cent above the UK average and we’ve retained our place as one of the most innovative cities in the UK based on patents registered. This report shows that despite our challenges, Peterborough remains a very attractive location to live, work and invest.